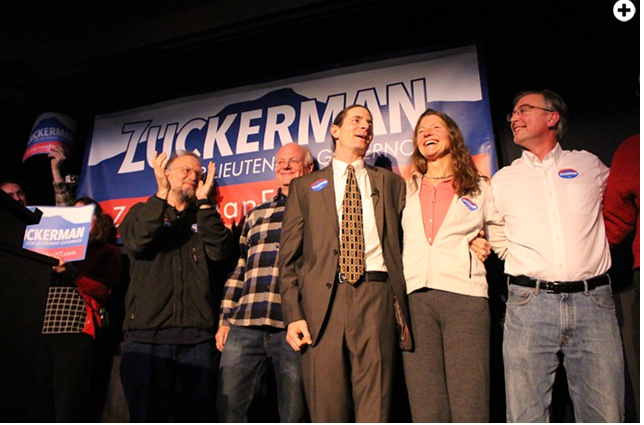 Sen. David Zuckerman kicked off his campaign for lieutenant governor last fall. Sen. David Zuckerman (P/D-Chittenden) will not be eligible to pursue public financing of his lieutenant gubernatorial campaign, according to a federal court decision issued Wednesday afternoon. U.S. District Court Judge William Sessions III ruled that several limits on Vermont’s public campaign financing law are constitutional. Those restrictions include barring candidates from taking public money if they begin campaigning before February 15 of an election year. “It means David Zuckerman is disqualified from public financing,” said his lawyer, John Franco. The Hinesburg farmer announced his candidacy last November, arguing at the time that waiting for the public financing window to open in February would put him at a disadvantage. Two of his rivals for the Democratic Party nomination, Marlboro businessman Brandon Riker and Rep. Kesha Ram (D-Burlington), had already declared their intent to run — both without the assistance of public financing. Though his eligibility for the program was in question, Zuckerman proceeded to raise money under the terms of the law, which requires those seeking funding to gather $17,500 from at least 750 voters in amounts of $50 or less. Doing so can qualify such candidates for up to $200,000 in public funds, minus what they raise to qualify. At the same time, the candidate joined an existing challenge to the public financing law filed by Dean Corren, the 2014 Democratic/Progressive nominee for lieutenant governor. Corren had run afoul of the law’s strict conditions during his unsuccessful run and had sued in federal court to declare those conditions unconstitutional. Zuckerman said that if his and Corren’s legal challenge failed, he would take part in the traditional fundraising system, which allows candidates to accept larger contributions but provides no public funding. “I’m happy to have clarity,” he said Wednesday after learning that the court had rejected his argument that the law unfairly burdened those taking part in the system. Even without public assistance, he said, he would continue to seek small contributions — citing as a model the presidential campaign of Sen. Bernie Sanders (I-Vt.). “I look forward to running a campaign similar to Bernie’s with a legion of small donors and focused on important issues,” he said. Zuckerman had also asked the court to allow candidates participating in the public financing system to raise additional money in order to match opponents’ fundraising totals, arguing that they would otherwise be at a disadvantage. Sessions nixed that wish, too, ruling that it’s constitutional for the state to place limits on how much money publicly financed candidates can raise. Though Corren’s federal challenge was denied, he continues to fight the sanctions he faces in state court. Attorney General Bill Sorrell has sought $72,000 in fines and restitution over allegations that Corren improperly asked the Vermont Democratic Party to email its members on his behalf. Sorrell has argued that the email constituted a $255 campaign contribution from the party, in violation of the public financing program’s strict limits. Franco, who also represents Corren, said he hopes that Sessions’ federal court ruling will help his client’s case in state court, as Sessions noted that candidates receiving public financing are entitled to work with political parties.